In September 2013 Spain introduced a Golden Visa investment scheme to attract investment in Spain by non-EU citizens. The laws were amended in 2015 to make it easier for applicants to obtain the Golden visa in Spain. The Golden Visa Investment scheme allows non-EU investors to apply for Spanish residency and later citizenship in return for significant investment in Spain provided that certain criteria are met. We have provided some general information below*. If you would like further information from an experienced Spanish lawyer in relation to the Golden Visa please contact Worldwide Lawyers. What are the requirements for a Golden Visa (Investor Visa) Application in Spain? c) is technologically or scientifically innovative. The investment can be made by either an individual or a company provided that the company is located in a country considered to be a tax haven and the individual has control of the company’s shares. What is the Golden Visa Application Process in Spain? If the Golden Visa application is visiting Spain in order to consider their investment, for example to view potential properties, they will need to apply for a Schengen Visa in order to visit the country. This visa allows the applicant to visit Spain for up to 90 days. The applicant will need to apply for the Residency Visa. This entitles the investor to reside in Spain for up to a year and travel freely in the Schengen area** for 90 days out of every 180 days. This can be obtained by having made one of the investments set out above. An experienced lawyer will be able to assist with this application. If the investor wishes to reside in Spain for longer than one year, after the first year they will then need to apply for a Residency Permit. The Spanish Residency Permit will allow the investor to live in Spain for up to 2 more years and is renewable for 5 year period providing the requirements for the permit are still being met. This can eventually lead to Spanish citizenship being granted to the investor. have complied and be up to date with all tax and social security obligations. If you have been resident in Spain for 10 years or more, Spanish citizenship can be requested. 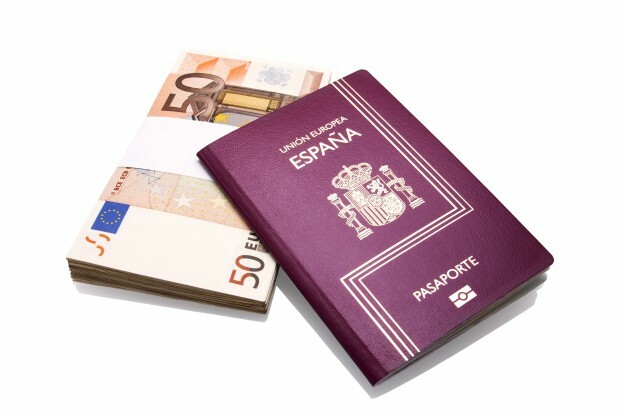 What are the requirement for investing in Spanish property in order to obtain a Golden Visa? In order to apply for the Golden visa on the basis of a property investment, each applicant must invest at least €500,000 in property in Spain. The law requires that the first €500,000 of the property purchase price is unencumbered – this means that this must not be financed by a loan/mortgage. Any value in excess of €500,000 can be financed through a mortgage if required. The investment can be comprised of one or several properties as long as the total value of the properties is €500,000 or more. On top of the purchase price of €500,000 or more the investor will need to budget for an additional 10 – 12% of the purchase price for usual additional costs of the property purchase for such as purchase taxes, notary and lawyers fees. These costs can not be included in the €500,000 investment amount required and must be paid in addition. How long do you have to stay in Spain to qualify for residency under the Golden Visa? The Golden Visa is targeted at wealthy individuals who will normally be residing in other countries so there is no requirement for the applicant to spend any particular length of time in Spain to qualify for the Golden Visa and there is no requirement to be a tax resident in Spain. To qualify for permanent residency or citizenship however you will need to be resident in Spain for the required periods. Can I obtain permanent residency or Spanish citizenship through the Golden Visa programme? Yes eventually the applicant can obtain permanent residency and citizenship in Spain as long as all of the requirements are met. It is strongly advised to seek assistance from lawyers specialising in Golden Visa applications to ensure that the requirements are followed at each stage. Who can apply for a Golden Visa Application and who does the Golden Visa cover? A Non-EU citizen meeting the criteria set out above can appliy for the Golden Visa on the basis of investment. These Golden Visa laws require each applicant to make one of the qualifying investments, however, residence permits may also be granted to an applicant’s husband/wife or cohabiting partner, children under 18, children aged 18 years or over who remain dependent on the applicant’s financial support and who have not formed an independent family unit, and dependent ascendants ie parents and grandparents. How do I apply for a Golden Visa in Spain? It is strongly advised that before committing to invest in Spain for the purpose of a Golden Visa application that legal advise is taken from a recommended Spanish lawyer with experience in dealing with the Golden Visa Applications. If you would like to be put in touch with a lawyer to assist you with buying property in Spain and/or applying for the Golden Visa in Spain, contact Worldwide Lawyers on 01244 470 339 at info@worldwidelawyers.co.uk or via our Contact Form. *The information provided is intended as general guidance only for those considering applying for the Golden Visa in Spain and is not a substitute for specific legal advice about your specific information. If you would like specific legal advise in relation to Golden Visa Applications from an experienced lawyer contact Worldwide Lawyers.